The L.A.M. 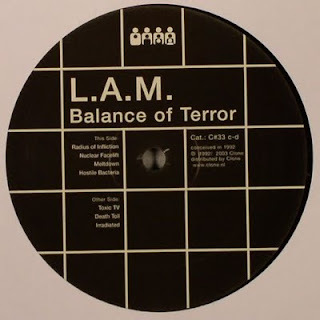 ‘Balance of Terror’ 12“, which stands for Life After Mutation, is the third and final pre-Drexciyan musical document that we have; the others being Clarence G (Stinson) and Glass Domain (Donald) which have both already been covered by me in previous posts. The most notable thing about this record to the others is that from this point on James Stinson and Gerald Donald were finally working together. 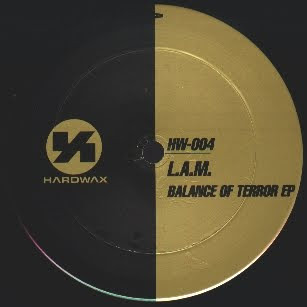 This release was most recently reissued by Clone in November 2003 but it had actually been reissued once already, in 1996, when Hardwax reissued most if not all of their 12" catalogue released up to that point. I have pictured images of the three editions throughout the article but basically as far as the Hardwax editions go the original had a silver label, the second reissue had a gold and black label. Hardwax was a Detroit label set up and run by techno legend of today Robert Hood. One of the big three of the so-called second wave of Detroit Techno, the others of course being Jeff Mills and Mike Banks. This puts Hood right on the ground floor as far as Drexciya were concerned but UR, via Shockwave a UR/Submerge sub-label, would take up their cause by releasing their debut ‘Deep Sea Dweller’ 12” later the same year. The big question a lot of people might have about this L.A.M. release is does it sound like Drexciya and is it any good? Well it doesn’t sound too much like them but there are moments and yeah I would say it's worth tracking down if your a fan. On one level it is simply the sound of two young guys enjoying the procedure of making music together and coming up with a thin concept to go along with it. On another level they are pushing some extremes with it as well, in the manic tempos and overall weirdness departments. It could be argued they might have felt they had something to prove being on such a 'hard' label but because of the humour on display I don’t think so. But more than this reason you have to remember that this was only the fourth release of the label which itself had only been launched the year before so they probably felt they had very little expectations to live up to other than delivering a good record. Since that time I guess Stinson and Donald must be ok with it considering they allowed the most recent reissue, although Stinson would have already died by the time it came out but I guess if he had had any major problems with it he would have previously made this clear. The most obvious thing you will notice about the record is the sense of humour I mentioned and yes a certain manic ness about the production. Although it is not as over the top as you might expect from its reputation but at the time maybe it was. I guess we have gotten used to so many extremes in music now it's hard to really know what people would have made of this record at the time. There is also a simple and cohesive concept to tie it all together as well, another first for them and sign of things to come, which I will go into in more detail after looking at the music. The opening track, 'Radius Of Infliction', is hard, fast and aggressive but if you think this is all there is to expect from this EP you are mistaken. It is a good runaway track which most immediately sounds like it was done live, like all the tracks here, which is something Drexciya would continue doing as part of their production technique. It also has an interesting fake ending. 'Nuclear Facelift' sounds as disturbed as its title suggests. The tempo is slightly less manic but the weird slithering vibe it gives off more than makes up for that. It has some very original sounds used throughout. The end of this track is interesting, totally unlike how it started, almost ambient. There is a track called ‘Kubi’ from 1999 on the self-titled Japanese Telecom album that sounds like it could have fitted on this release very well. Fitting as it does into this more manic visceral template which they are using on about half the tracks on this release. The other half are at a slightly lower tempo but much more weird! The next track, ’Meltdown’, would be one of them. It sounds like it must be something of an experiment at just over the one minute mark but this is also the one where we first hear a more familiar sound emerging. 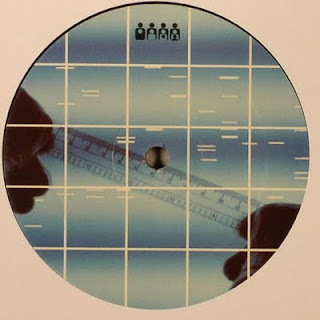 The end keyboard passage in particular sounds very familiar but I couldn’t locate its sound-a-like anywhere for sure on any Drexciya related projects, probably in a section of Neptune’s Lair, maybe you can? I guess in the process of playing round and experimenting while making this record they would inevitably fall upon some of what were to become their future trademark sounds. 'Hostile Bacteria' sounds a bit throwaway to me, it's a full length track though but with not enough idea's to sustain it in my opinion. Nothing in it that sounds like Drexciya either, not that that matters. It is again uptempo and weird sounding, like something pulled out of shape from hostile bacteria maybe, the end is fairly unique and experimental though it must be said. Side two, an alien concept to many these days, begins with ‘Toxic TV’ which sounds a bit more like Gerald Donald was at the controls and even shares his type of humour to a degree although they both probably did it. It does have a vocal as well which is delivered by a male and runs, “We are on TV.” The sample makes it sound even more like it was made by some excited kids, although we know for sure that Stinson would have been around 22 when he made this. It really kicks though, a very full on and raw production, maybe even my favourite. It does have a bit of a Drexciyan flavour as well in the breakdown. Again the ending is also really interesting and fun. I guess endings and breakdowns can tell us a lot about an artist, it’s always an opportunity to do something different from the main track and a certain quality of artist relishes taking advantage of these type of opportunities. 'Death Toll' is another aggressive and weird sounding track, very manic for sure, sounding like it’s about to spin off its axis at any moment. I imagine hearing this or 'Nuclear Facelift' on a sound system late at night would be an unsettling experience. The bonus track on the Clone reissue is ‘Irradiated’, which at just over the one minute mark was probably rejected by Robert Hood and maybe even themselves at the time as just being too mad. A slowed down male voice says, "I am a mutation, a victim of radiation, you might ??? (undecipherable)”. It is sort of hilarious though but I guess Clone could entice a few more people with it and at least gives us the complete record at last. This tells us that someone was certainly looking after the Drexciyan archives to find this as well. There has got to be much much more unreleased stuff. Will it ever come out? Should it come out? I said at the start that if you were a fan this release would be worth getting but if they had for some reason never made music again I guess it would by now be seen as just a curio in the deleted Hardwax catalogue, just some more Detroit kids doing something more off the wall than usual. One thing I would say though is that it hasn’t really dated in my opinion, maybe some of the drum sounds give away its vintage, but actually it does sound kind of fresh but like no one else, certainly not very Detroit either. In fact most of it sounds like music from another planet, I wonder if they were even familiar with what their immediate contemporaries were doing or were they even then not listening to anyone else’s music so as not to risk being influenced? Anyway, it’s not bad for their first joint production and for what is now a 17 year old record, hard to believe that! They didn’t exactly lose their hard edge for the ‘Deep Sea Dweller’ 12” (the first two tracks on side one are similarly full on but they would quickly change this approach for their next EP) but the concept there, just less than a year later, was a lot more sophisticated than the more one dimensional one we find here; which is simply mutation brought on by nuclear reaction. The titles, unsurprisingly and predictably, appear to be giving it all a bit of a negative slant as well; ’Death Toll’, ‘Hostile Bacteria’, ’Nuclear Facelift’, ‘Meltdown’, ‘Irradiated’. ‘Balance of Terror’ itself is kind of confusing as a title, but I guess in this context it means simply that terror/fear is winning out, it has the balance. It sounds like it belongs as a chapter heading in some cold war manual. ‘Life after Mutation’ is kind of proposing a positive in a way, at least life continues, is this some actual balance emerging to this concept? Maybe not as what quality of life are they proposing? Not a good one going by the other titles I think. This is what makes it all a bit one dimensional in my opinion and it would have been difficult for them to develop this concept in the future. But I know I know it’s probably not meant to be studied that deeply and there is ‘Toxic TV’ to look forward to inside the ‘Radius of Infliction‘! The concept of mutation does of course carry on in Drexciya but there it is framed as a rapid mutation of the offspring of pregnant African slaves thrown from slave ships as disruptive cargo where they become the Drexciyan deep sea dwellers. This latter concept would prove extremely fruitful for them and this theme of change would blossom further to embrace an inner and outer evolution of Man. 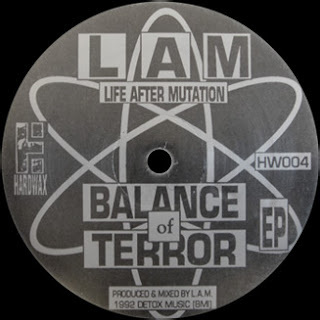 Their Storm maxim some 10 years later would be ‘Don’t be Afraid of Evolution’ and I previously discussed in earlier articles how over coming fear is a necessary step towards evolution so maybe in some weird way with L.A.M. they were examining one of the major causes of our fear of the future, the idea that science will destroy us? Maybe they didn’t themselves realise they were doing this at the time but it does strike me as interesting that fear is the first concept they came up with and they came to realise that overcoming it is the only way to move forward. In very broad strokes and remembering that they both worked together as well, in this context Gerald Donald in his solo work could be seen as overcoming this fear of science by understanding it. Stinson always struck me as more intuitive and kind of overcame it with love and trust but they have both been taking a big journey which we have been privileged to have been able to share with them. Hardwax licensed two of these tracks (Radius of Infliction & Nuclear facelift) for the Japanese market on the 'Techno Global Power' Vol.1 and 2 compilations on Alfa Records in 1992. These CD’s are said to be so unbelievably rare today that if you find one you could retire or at least listen to a myriad of early Robert Hood, Jeff Mills and UR rarities in digital format for the first and in some cases only time. Interestingly Vol. 1 credits ‘Radius of Infliction’ as mixed by L.A.M. and written by Gerald Donald but credits on these type of compilations can be notoriously inaccurate at the best of times but maybe it’s accurate as someone went to the trouble of writing it down! 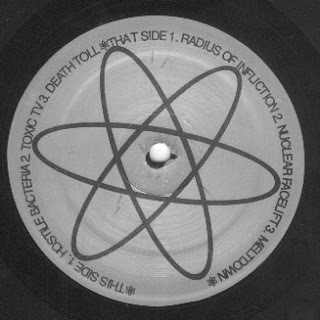 The artwork is fairly simple, on the original edition that universal nuclear sign is used cleverly and for the Clone reissue it just got the inhouse treatment. Clone doesn't tell us who made it though but on the original the credit read 'Produced and mixed by L.A.M.' I guess most people buying it in 2003 knew who the creators were but this does tell us that the all-important anonymity which would become a Drexciya trademark was already decided on at this early stage. Hard to believe for me but this article brings to an end all of my articles on the previously released James Stinson and Gerald Donald records. While this final article didn’t reach the very large word count that some releases needed to do justice to them I feel this is all that I can meaningfully say about L.A.M. So thanks for reading DRL so far, the next post could be anything as waiting on the artists to take the initiative will become a factor for me from this point on. Although I’m sure I’ll still think of original things to write about and am sure there will soon be more live shows, projects and records to research. Zerkalo will be playing live in Liege, Belgium in a few days on 16th October 2009. More details at their MySpace. 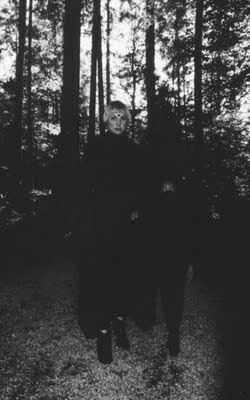 There is also a new Zerkalo track on their MySpace player, an instrumental called ‘Zelenogorsk’. I found there are two candidates for Zelenogorsk in Russia, one is a seaside town near Finland and the other is located to the south west of the country. This latter one is more than likely the one they are referring to if that is what they are doing. During the cold war it was a so-called 'closed town' where uranium was enriched and did not even appear on maps until 1992. In the context of Zerkalo it reminds me most obviously of Tarkovsky’s ‘Stalker’ which appears to be set in just such a mysterious town or zone. If you search GoogleVideo you can currently watch this movie if you have two and a half hours to spare. Well worth it if you do. 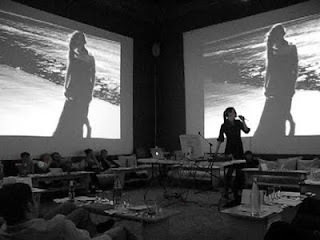 Also check out this new all things Drexciyan Blog which is currently hosting about 30 minutes of Dopplereffekt's Paris show on 3/10/09. One for the archives for sure, just located this great Black Replica picture as well which somehow passed me by.